Revised October 3, 2018. This blog post has produced a very positive response and healthy debate and conversations. In respect for the opinions expressed by a few, we have revised some of the language — though not the essence — of this blog post. The Child Center of NY firmly believes that every voice deserves to be heard. Women and men were in tears and visibly upset at work yesterday. Some may have been survivors of sexual assault themselves; and many of them, especially clinicians in our behavioral health division, have worked with clients who came to The Child Center for help dealing with what we know are the effects — long-term and short-term — of any sexual assault. 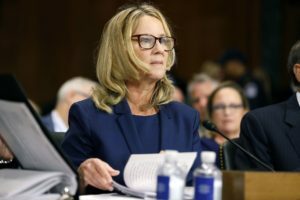 We were huddled around phones and computers, watching with astonishment and disbelief at the Kavanaugh hearings, at the questioning of Christine Blasey Ford, Ph.D., and Judge Brett Kavanaugh. Our disbelief was grounded in our professional knowledge of how survivors of sexual assault should be treated, and this was not the way. Most frustrating was the focus on this highly intelligent woman remembering every detail about something that happened over 30 years ago. As any expert in sexual assault will tell you — and the senators should have asked one — it is not the details of orientation that a victim remembers when assaulted and traumatized, but the sensations, like smells, sounds (of music, of laughter), touch (of a hand over one’s mouth), and tastes. Then, as now, the majority of sexual assault victims want to forget what happened to them. They do not necessarily memorize dates or places; it’s not like remembering where you were when President Kennedy was shot or the Challenger went down. The treatment of Dr. Ford is certainly not the same treatment as that given to men who shared the horrific sexual assaults and abuse at the hands of priests that occurred, like Dr. Ford’s assault, about 30 years ago. These men were commended for their courage, taken at their word, interviewed on major networks, and hailed as heroes for paving the way for others. As it should be. Conversely, leading up to the hearings, a lot of press was given to the fact that Dr. Ford “waited” 36 years to report what happened to her. This, too, shows a misunderstanding of sexual assault. As any expert in sexual violence will tell you — and again, the senators should have asked one — the act of not reporting a sexual assault after it happens is not unusual at all. Two-thirds of victims of sexual assault never report their crime today, let alone in 1982. The reasons for not reporting are as varied as they are disheartening. And even today, with all the awareness of sexual assault, people are questioning if what happened to Dr. Ford was even that big a deal. I hear and see comments even from women that question why she can’t get “over it” when “nothing happened,” and that question whether a man should be held accountable for something that transpired 30 years ago, when he was a teenager, and boys will be boys, after all. All of this is why most women will take these experiences to their graves, often struggling with the symptoms of trauma throughout their lives and not even connecting the dots. Often allowing accusers to never be held accountable and free to leave a wake of victims behind them. We see the effects of this kind of trauma in our kids every day. We counsel children like Tiffany, who was raped at 11, so they can learn to heal, and we also offer preventive measures, like our Comprehensive Pregnancy Prevention Program, which promotes healthy sexual behaviors and relationships. We also must teach kids and adults how to talk about it. But in order for programs like these to become the norm — and for relationships based on respect to be the norm — we have to acknowledge there is a problem and show that we take violations of this norm seriously. One of the two men accused of this crime is now up for a U.S. Supreme Court position — a lifetime appointment. The fact that it took so much for people to agree just to investigate makes me worry about the effect it will have on people reporting sexual assaults in the future. It is truly heartbreaking for women around the world to watch us digress and turn back the hands of time. We have worked so hard to get women to report, to seek help, to know that they matter. The Child Center of NY is committed to providing a safe space for sexual assault survivors to share their experience and learn to heal. Please visit our Individual and Family Counseling page for a list of our clinics and how you can contact them. We are here to help. We also should keep in mind that there is zero LEGAL burden to select Kavanaugh for a role he clearly is ill suited to fill. It is not an inherent right to be a Supreme Court Judge and no one is prosecuting him for the crimes he allegedly committed as a younger person. That ship has sailed, but the credibility of the stories has not. We have always scrutinized the qualifications for this role and why should it stop now? Any thoughts on Merrick Garland? Has Kavanaugh displayed an atom of judiciousness?